Emoze implemented the LWUIT technology to deliver unique web-like graphics, flexible layouts and animated screen transitions on Java-enabled mobile phones. Simple, stylish and useable, emoze has added swivel-screens, cool themes and animated screen transitions as some of the new benefits. The emoze solution delivers a slick, colourful and well laid out messaging and content client for even the most basic mobile phone, mirroring the familiar experience users know from their PC. With even broader handset compatibility, accessible on more than 800 mobile devices, outstanding graphics and flexible layouts, emoze expands the limits of the user experience and creates an intuitive and visually-smooth transition from desktop to mobile. Going forward, emoze is currently developing technology that will allow consumers to have live news, weather, sports, stocks and shares information, pictures and video streaming and more – pushed directly, and in real time, to their mobile device taking the user experience to even higher dimensions. Using new state-of-the-art technology from Sun Microsystems, getting mobile communications and exciting content, for business or pleasure, has never been easier – all that is required is a low-cost data package from any service provider. 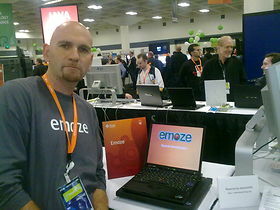 “We’ve invited emoze as a Java ME ISV at this year’s JavaOne conference to highlight the advancements in the ‘push’ content mechanism that their Java ME application promises. emoze’s use of LWUIT is a perfect example of how this technology can significantly enhance the end user experience of an application that offers a key communication solution on mobile devices”, said Nicolas Lorain, group marketing manager, JavaFX applications and ISVs at Sun. This entry was posted in Programming, Technology, Work and tagged Emoze, Java One, LWUIT, Sun by miron. Bookmark the permalink.